The newest attraction in Brighton – Brighton Wheel, going 50 metres in height above sea level is already open. Outstanding views over the city from 36 enclosed glass gondolas with air condition including one VIP gondola. Gondola can hold up to 6 adults and 2 children. 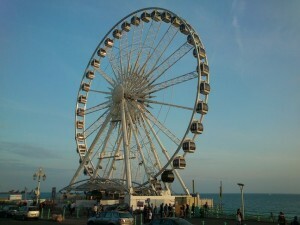 The wheel is located right on the seafront next to the legendary Brighton Pier. The ‘Wheel of Excellence‘ will offer breath-taking panoramic views of the sea, surrounding architecture and landmarks. Providing an optional commentary guided tour of the heritage of Brighton & Hove. Attraction is open from 10:00 in the morning seven days a week. Tickets are available in wheel ticket office and they will be available on-line very soon. The developer of the Brighton Wheel is Paramount Attractions. The cost – £6 million. It can carry up to 200 visitors. There was about 30 part-time and full-time jobs crated. Truly fantastic experience with excellent views over the city of Brighton. This really is a “must do” on your visit. We have now changed our VIP Package prices. Our VIP Package is now £50, and our VIP Champagne Package is now £60. Book online for a 10% discount.